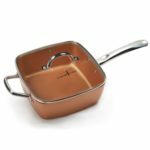 Copper Chef Pan Review? What is the Best Non-Stick Pan? Don’t believe the no-stick nonsense about any frying pan much less the Copper Chef Pan which is one of the latest touted as the best non-stick pan you can buy. I purchased the large, square Copper Chef Pan about a year ago. One of the things that attracted me to this pan was it’s size and depth and fact I can even place it in an oven for baking. My expectations about the much-hyped non-stick frying service was skeptical at best. I’ve tried numerous pans and they all stick after a while whether I use a properly-seasoned Cast Iron, Stainless Steel, or Teflon-coated pan. The infomercial claims on the Copper Chef pan look oh-so impressive, and it really is great how versatile this pan is. You can use it to fry, but it is large enough that you can also use it to cook sauces, soups or deep-fry. Probably, the best luck I’ve had with this particular, ‘non-stick’ pan is deep-frying potato wedges. The bad news is that solid meats and oil residue began sticking right in the middle of the pan after about only 3 weeks of use. I usually get 6-8 months out of a non-stick, teflon-coated pans. I have a couple of Pauls Dean pans that are still stick-free after 3 years. I have better luck with the smaller pans and now I know why. Why do some People have Better Luck with Non-Stick Frying Pans? You can find dozens of articles and techniques of non-stick cooking examples not only with the various types of non-stick coated pans, but with traditional cast-iron and stainless-steel as well. Of course, the difference with these traditional pans is that they really do require a technique to keep their surfaces from having food stuck to them. The one key is temperature control and consistency throughout the entire surface of of the burner that the pan makes contact with. A non-stick pan will eventually become corrupted and warped by over-heating or certain hot spots in the pan. This is Most professional chefs use cast iron and stainless steel pans. Most of them also use gas stove tops which provide superior heat control and consistency. The reason my Copper Chef pan began to stick in the middle is because that is the where the hottest spot is on my electric burner. It makes sense that a gas or an induction burner spreads the heat more evenly throughout and because you have more real-time control of the different levels of heat, you are much less likely to risk exposing one part of the pan to too much heat. A properly seasoned cast-iron will still stick where food is exposed to the portion of the pan that gets too hot. This is because the coated seasoning will burn off. This area is usually right in the center of the pan which happens to be exactly where my food is getting stuck on the Copper Chef Pan . The reason all non-stick, frying pans will eventually begin to stick is because they have been over-heated in the center on an inefficient electric stove top. I have noticed that if arrange my food on the outside perimeter of my Copper Chef pan that I can still have a stick-free, cooking experience, though it is not the most efficient way to cook. There is another thing I have done that has helped revive my square Copper Chef pan to become stick-free again, at least temporarily. Drench some extremely light olive oil or some other type of oil that has a high cooking point on a soft piece of cloth. Rub the oil around the inside bottom and sides of the pan and place in your oven at 300 Degrees for about 30 minutes. Let it cool, wipe-out oil, and repeat. Use the roast setting of your oven so both lower and upper burners are spreading the heat evenly throughout. Since I have done this, I notice I am able to cook on my Copper Chef pan without sticking as long as I am using a very moderate heat. Forget about searing meats or pan-frying steaks on the Copper Chef products with an electric stove top . You will create a very sticky pan. So, with all this said, what is the best non-stick pan? You can buy Teflon-coated, copper, ceramic, or any other number of fancily-named non-stick coated pans and still get them to stick over time. For that reason, the best types of frying pans you can buy are the ones the chefs use: stainless steal and cast iron. One, they taste better. Two, with the right stove, you really can learn to cook on them with a stick-free experience. Chefs learn lots of little tips. For instance, let these pans get hot first, before putting food on them. Or, use a bit of water before flipping off an over-easy egg. Furthermore, most of the time you can get the stuck residue off of them by adding water to the pan while it’s still hot. Make sure they are properly oiled prior to adding food and keep them seasoned. Third, the most overlooked reason of all is that you will never have to worry about damaging these pans. They are virtually indestructible and that means even if you do have food sticking on them occasionally, it’s not the end of the world. Fourth, the food will taste better and is healthier. Finally, you can be as rough with you want to get the stuck food off the bottom. You can scrape with a stainless steal spatula until your heart is content and you can use one of those really handy stainless steal scrub chains to clean them thoroughly. So, what is the point of the Copper Chef Pan or any ‘non-stick’ pan for that matter? I will keep the Copper Chef around. It’s still good for making small pots of soup, sauces or side dishes. What I won’t use it for is browning or searing meats. Leave those jobs up to my reliable and trustworthy cast-irons which will never have to be replaced. No more worries about stick-free cooking pans . They don’t exist. Get a couple of good stainless steal and cast-iron pans in different sizes and use them on an induction cooking burner or gas stove . As you become more familiar with cooking in these ageless, life-lasting pans, you’ll never go back to another Copper Chef or other supposedly non-stick cooking pan again. Below, I have chosen some products for you that will make life in your kitchen better for years to come.